The new 5-20 x 56 SHV™ provides even greater extended-range capability to any shooter; a variable power range ideal for most big game hunting environments; and the precision that comes with high magnification for the predator and varmint hunter. It reinforces the Nightforce commitment to make the company’s renowned quality and performance available to greater numbers of hunters and shooters through the more affordable SHV™ line. The 5-20 x 56 SHV™ is available in illuminated and non-illuminated reticle models. Illuminated versions feature center-only reticle illumination, which helps prevent low-light flare common to some “smart” reticles. External illumination control is incorporated into the side parallax adjustment. Parallax settings are marked in yards, and adjustments can be made quickly without removing the eye from the shooting position. 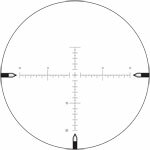 The same Nightforce-designed reticles offered with the 4-14 x 56 SHV™ are available in the 5-20 x 56: the IHR™ (International Hunting Reticle), an uncluttered, fast three-post design with floating center crosshair, applicable for use on virtually any game; and the MOAR™, an extremely effective minute-of-angle-based reticle that provides accurate rangefinding and hold-offs, even on small targets at long distances. Capped elevation and windage adjustments have .25 MOA click values, yielding 10 MOA per revolution of the dial. Total travel is 80 MOA elevation, 50 MOA windage within the 30mm tube. The new 5-20 x 56 SHV™ comes standard with Nightforce ZeroSet™ technology that allows a rapid return to the shooter’s chosen zero point, even after multiple rotations of the elevation adjustment. The 5-20 x 56 SHV™ provides exceptional clarity, resolution and color contrast across its entire magnification range, unlike many lesser variable-power scopes that exhibit a marked deterioration of quality toward the higher end of their power ranges.